Nicholas Wells proves to be a singer-songwriter with a heart of gold in his newest video for “Empty Coffee Cups.” At first appearing to be a simple video, with just Wells sitting as his piano, the piece quickly transforms into an artistic and visual endeavor. The imagery of the video stands out tremendously as his vocals evoke a very haunting emotion that sets the tone of “Empty Coffee Cups.” One element that definitely stands out is the performance of the young women performing a ballet-style dance. She blends perfectly with the overall spirit of the video; simple, yet captivating. Clearly playing each other’s love interest in the video, their subtle acting intrigues with intricate hints of lust and adoration weaved throughout. “Empty Coffee Cups,” also shows the gorgeous tones of Wells’ vocals and piano playing abilities, providing an ideal backdrop for the video. Wells is no stranger to music, as he has been honing his passion since a young age. Releasing his first album at the age of 17 in 2005, his upcoming record, Stumbling Forward, will no doubt show an artist that has grown in his musical writing and mindset. “Empty Coffee Cups,” is just a taste of what Wells has to offer, as his musical maturity is that of a seasoned songwriter. Stumbling Forward will be available October 6th. Artist Spotlight: Nicholas Wells And "Stumbling Forward"
Last year, Carriage House Studios engineer Mikhail Pivovarov was driving home from the grocery store when he got a call from Nicholas Wells. The two had recently completed mixing Wells' latest album, a project that was already a year in the making. "He said, ‘I wrote this new song, it's fantastic,’" explained Pivovarov, who listened intently as Wells sang him a verse over the phone. They had both thought the album was finished, but Pivovarov knew they would have to head back into the studio after hearing a few lines from the new song – and it was a good thing they did. That song ended up being "Empty Coffee Cups," the first single off of Wells' newly released album, “Stumbling Forward.” The song debuted on September 15th with a music video directed by Jaclyn Gramigna and starring Wells alongside dancer Esme Boyce. "Making the record was such a milestone for both of us," said Pivovarov. "The record is very personal for Nicholas; you hear it in the songs. They come from the heart and from real experiences, and the crazy thing for me is I was there for all of those experiences." Wells is not just another client for Pivovarov. The two met in college and have been working together for years. Their production company, Add9 Productions, often records at The Carriage House. In fact, many of the instruments on “Stumbling Forward” are played by musicians they’ve collaborated with on past projects. The roster includes Stephen Chopek on drums and percussion, Ryan Hommel on guitar, Tommy Mandel on organ and Wurlitzer, Ally Jenkins on violin, and Dave Eggar, who wrote much of the record’s string arrangements, on cello. Wells himself wrote and sang all of the songs on the album, in addition to playing piano and acoustic guitar. Pivovarov played bass. While he’s proud of the entire album, one of the highlights for Pivovarov is the song “MidnightHours.” Beautiful in its simplicity, it also exemplifies some of the pair’s more creative production decisions. The demo was recorded by Wells in his living room late at night, and they decided to replicate the natural sounds that were picked up through the open windows when it came time to do the professional recording. They stuck two microphones outside of The Carriage House’s Studio B late one night to capture the nighttime sounds that were part of Wells’ original inspiration for the song and faded them into the music. Additionally, they chose to forgo Pivovarov’s bass playing for something a little more acoustic that blended with the mood of the song: Pivovarov took a drum mallet to the low bass strings on the piano and created a sample library, which Wells then played on the keyboard. 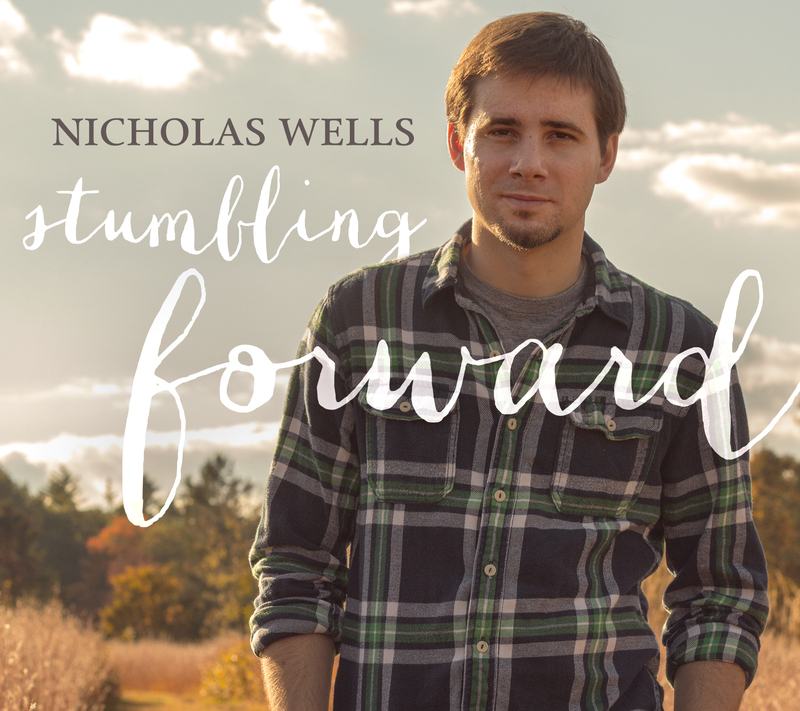 “Stumbling Forward” was officially released on October 6th, and while it might seem easy to celebrate the record’s completion, Wells is already looking towards the future. It likely won’t be long until Pivovarov is getting another phone call that starts the journey towards tomorrow’s single. For now, however, the two plan to issue recordings from the release party at MTK Tavern in Mt. Kisco, NY, as they line up shows to promote the album. For more information on Nicholas Wells, visit NicholasWellsMusic.com and follow his latest updates on Facebook and Twitter. Check out “Stumbling Forward” on iTunes, or purchase a physical copy on CD Baby. For upcoming shows for Nicholas Wells check out the Nicholas Wells BandsInTown page. I have just found another favorite artist, Nicholas Wells. He is out of New York and has released an EP Somewhere Down the Road in 2008 and the album Something to Believe In in 2010. He is set to release his new album Stumble Forward in October. In addition to his records, he has had two songs of his featured in the 2012 movie Morgan and also wrote the song “Eat Me” that was performed by Dante Palminteri in Sharknado 2 and “This Christmas It’s You And Me”, performed by Nicholas and Joe Scarborough on MSNBC’s “Morning Joe.” Not a bad resume for a 27 year old!